For the last 8 years I have worked so many jobs trying to find a career after my initial plan to be an RN crashed and burned in 2010. I am a single mother to a beautiful daughter who is now an adult and I am very excited about becoming a trucking gal! I have had many 'jobs', including cashier, pizza delivery driver, health unit coordinator, diagnostic imaging clerk, warehouse picker packer (NEVER AGAIN lol), gas station attendant, 411 operator, cell phone tech support agent, 911 operator, and FEMA customer service agent just to name a few. None of this made me happy, paid my bills consistently nor cared about me or my family. 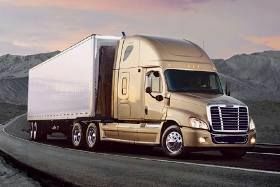 So, I am taking my multitude of skills to the trucking industry where my heart lives!!! Cant Wait!! My trainer just uses his phone Takes a picture, sends it in. He has a Samsung Galaxy Note, or if you prefer? A Samsung Galaxy J9, same animal, except the Note comes with a stylus and place to store it. The J9 doesn't. But the scanner and free fax service is an answer to how to fax from the road. You scan the document as a PDF, upload it to the site, and they send it as a fax. They advertise on a cover page, but no big deal. I used it for years. You may be able to simply email the PDF as well, and skip the fax entirely. Melissa, are you just concerned with getting information in to your employer, such as paperwork for loads completed? Or are you thinking of doing some type of side business while out on the road where you need access to a fax? Every trucking company out there has a convenient way for you to send in your paperwork. Most of them are doing it with a simple to use phone app. Some of the ones who are not so up to speed still use scanners at the truck stops that are free to use (the driver pays no fee). If you are adverse to using the app your company will provide for your phone, you can still use the truck stop scanners. We may need more information on what it is you are wanting to accomplish, I can assure you there are very few of us who keep a fax machine or scanner in our trucks. I have seen a few people doing this, but it is rare. Hi, Thank you for the info. After a traumatic event happened in my life a few years ago I qualified and received 5 years of subsidized housing. They require a ton of information be reported- a ridiculous amount-if you ask me- but nonetheless I am required to report a slue of otherwise nonsensical information. They run an extremely archaic program in terms of technology. They have none. Everything is a paper file with a paper receipt. I cannot email them either. I can turn documents in in person, by mail, or by fax. Fax is the only thing I trust when I am away. I don't want to be paying per page (its not just a few pages) on a fax service from my phone having to try to take pictures of otherwise shotty forms that are packed with info and almost impossible to take clear pictures of. Having to stop to fax large stacks of information is not what I want. I am a do it now type of person so I'm not really wanting to have to drag things out and wait for a stop and hope the machine works or face any other possible problems. As you stated it is rare to have this but you have seen it. I know it exists and I hope someone can answer my question. 3.& how are you keeping a WIFI connection going without accessing a cell phone for a modem. They aren't looking to see that you are "recently employed." They are looking for a three year history with little to no employment gaps in it. We've seen a lot of folks that got rejected by Prime get picked up immediately by other companies. You can always make a plan to get started somewhere else, complete your first year of employment with them, and then talk to Prime again, but if you're doing well it may be more beneficial to Stay Where You Started. Hello and super thanks for the information. I understand better now what the employment requirement is after reading this. I suppose I wasn't too clear- I have verifiable work history, 25 years in fact, but the last 6 years has been me changing jobs (5 in fact) trying to piece together my life after some tragic circumstances directed me away from the nursing degree I would have had completed in 2012- which, as of my last job with Dept of Homeland Security , has left me in a self employed role for last 6 out of 8 months not wanting to add more traditional employment to my resume unless it was an actual career. I called Prime Inc and spoke to Stacy who said that I should be just fine. She exclaimed that had I remained unemployed after December when FEMA ended, up until today, I would not qualify, but- as long as I can provide financial statements or check stubs proving I am self employed with Uber Eats I shouldn't have a problem at all. 1. As I understand Prime Inc will not accept a student who has been unemployed for a set amount of time. Is this true and does anyone have the specifics on time frame? My last REAL job ended Nov 2017, (it was a temporary government job w/ government), which I received unemployment for until it ended in March. I then became a self employed driver for UBER Eats delivering food while I look for a new career not just another job , and I am still self employed with them today. So does that mean I am unemployed according to Prime Inc? I really want to work for Prime and if I have to I will go take a gas station job or something just to be considered 'recently employed'.